Rear Rotor Outside Diameter (in): 12.000 in. You expect three basic things from innovative brake technology: better stopping power, longer life, and zero noise. The EBC Stage 7 kits consist of Orangestuff brake pads, BSD Sport Series rotors, and caliper lube--everything you need to upgrade your vehicle. 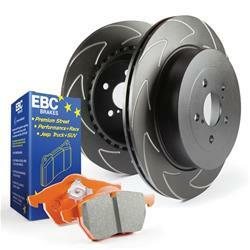 That's just the beginning of why EBC extra-duty light truck and SUV brake pads have taken the industry by storm. The backing plate steels feature NUCAP NRS system hook technology for five times the bond strength of conventional pads, while the fade-free material itself performs in both frigid winters and temperatures exceeding 1,400 degrees F--well above the maximum experienced in heavy braking, towing, or downhill descents. High-volume Vee grooves in the pads help to remove debris and better cool-vent the hot center areas. The new carbon granule-based extra-duty material is rotor-friendly, minimal in dust, and noiseless. The supplied high-carbon blade rotors offer unbeatable performance for fast road and race use on hot hatches! These 100 percent British-made rotors feature high carbon and high silicone levels that deliver matchless performance under high braking loads and temperatures, as well as rotor vibration dampening that reduces braking noise. They also receive a black GEOMET coating that looks great and prevents corrosion.